The chemical composition of today’s bowling ball covers paired with flare leads to a weighty amount of oil being removed from the lane at a fast rate. 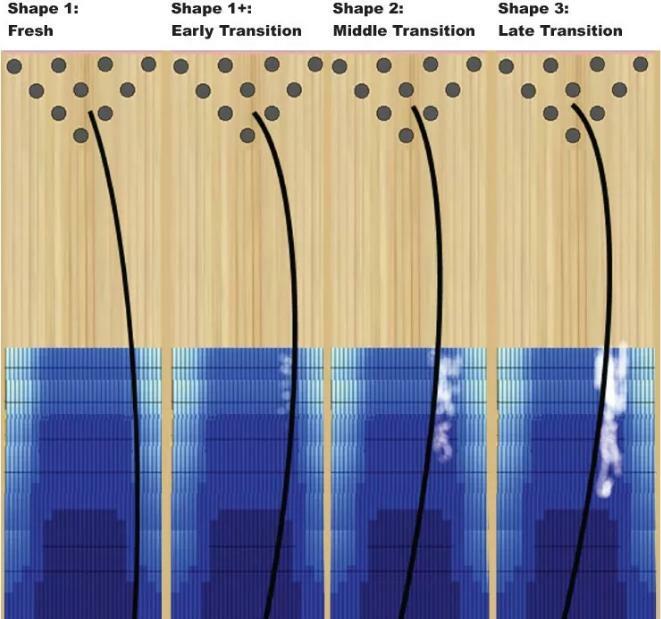 In order to make proactive lane play decisions throughout a block, players must know oil depletion is the single most influential factor in lane condition transition and the subsequent changes in ball motion. With evolving levels of friction, the margin of error a player experiences will increase initially and then decrease over time if the bowler is not proactive in his movements. Without awareness and knowledge, a player can’t capitalize when there is the presence of more margin of error nor move proactively when this margin has decreased. Without this recognition and subsequent adjustments, bowlers will be giving away pins. Accordingly, understanding lane transition and making alignment and ball changes are the keys to maintaining a maximum scoring pace. Dealing effectively with lane transition is one of the most challenging skills to master for a player attempting to move from an evolving good player to becoming a great player. Before meeting El Dorado and El Diablo, we must begin with a simple truth about lane pattern construction. Most patterns have less volume at the end of the pattern due to a reduction of oil in the lengthwise taper design. Accordingly, one of the objectives of a skilled player should be to manipulate the end of the pattern to increase the margin of error, especially on the fresh. This is an example of good friction providing the player with the ability to miss left and right down the lane. As the end-of-the-pattern oil is depleted, friction is created that aids the player in creating area to score. This good friction at the end of the pattern is what I refer to as El Dorado. El Dorado is a friend with benefits. Like finding the mythical city of gold, this is the area you want the ball to find due to the margin of error created through the manipulation process. El Dorado increases scoring and is a friendly place that provides a big payout. As bowlers continue to play in the same general zone, oil is depleted and friction creeps closer toward the foul line and into the midlane zone. This midlane friction evolves into bad friction or what I refer to as El Diablo. 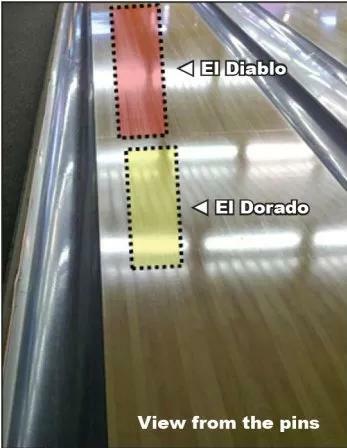 El Diablo is an unfriendly zone because it causes a bowler to lose carry due to reduced ball motion and the loss of hold. The ball motion in El Diablo territory is what I call the “Y”. RELATED POST: Bowling: Bạn chọn đánh thẳng, hook hay spinner? The Y represents an over/under situation brought about by the bad friction of El Diablo. If a bowler misses to the outside, the ball loses too much energy and has too little response to get back to the pocket with good carry. Conversely, a miss to the inside causes the ball to hook early and not hold pocket. These misses lead to a ball motion that looks like the “Y” shape you see in the image above. The white areas in the photo indicate increasing amounts of friction. If you see the “Y”, why are you bowling there? The bad friction of El Diablo presents a bowler with over/under ball motion. The situation is when you miss to the outside, the ball couldn’t recover back to the pocket and when you missed to the inside, the ball could not hold pocket and went Brooklyn. This situation reflects the presence of El Diablo or bad friction. When a bowler misses to the outside, the ball goes through the El Diablo zone, loses axis rotation and rolls early, leading to poor carry. Since it rolls early, it can’t change direction when it sees friction at the end of the pattern. It goes straighter out of the oil and can’t get back to the pocket, leading to an inadequate angle for carry. Conversely, when the bowler misses to the inside, the ball changes direction early and can’t hold pocket. It is impossible to get to El Dorado. To emphasize this concept, I stress the question, “If you see the ‘Y’, why are you bowling in this zone?” This question makes the point to focus on awareness of ball motion and to be more proactive. If you are not watching ball motion and only look at the pins, you will miss the development of El Diablo and the “Y”. On a fresh pattern, neither El Dorado nor El Diablo exist. A skilled player will use the practice session and team members to develop El Dorado at the end of the pattern. As El Dorado emerges, the player’s margin of error increases and scores increase. Over time, El Diablo begins to emerge. This emergence can be seen as a situation where either carry or hold diminishes. If there are similar total volumes, longer patterns will see El Diablo emerge faster than most medium patterns. RELATED POST: Bạn đã hiểu đúng về chuyển động hook của banh bowling chưa? A road map of successful lane play requires a player to recognize the emergence of El Diablo and avoid this evolving bad friction zone. This is best accomplished through launch angle changes accompanied with a shape progression strategy using the ball arsenal sequence. This is a visual illustration on how lane play launch angle migration would lead to the need to progress through shapes to avoid El Diablo and get to the benefits of El Dorado. An example of effective launch angle and shape progression on a medium pattern. On medium and long patterns, the most effective method for dealing with El Diablo’s bad friction is to continue to move inside. This will allow you to avoid it and still reach the benefits of El Dorado. As you progress inward, the shape of the shot needs to change in order to get to El Dorado with adequate axis of rotation. From a targeting perspective, you will need to continue to move the breakpoint and focal point inward to avoid El Diablo and reach El Dorado. Specifically, this inward movement will ensure that you avoid the negative ball motion influences of El Diablo. A bowler must become aware of the influence of good friction (El Dorado) and bad friction (El Diablo). This is a process of observation and reflection paired with the knowledge of one’s arsenal. Awareness occurs with purposeful practice and observing changes in ball motion as the lanes transition over time. Understanding the influence of friction on ball motion is a fundamental skill for players who want to reach the highest echelon of our sport. Developing comprehension of ball motion is an evolutionary process that comes about only through purposeful practice, understanding ball motion (layouts, cover, core, surface), and tournament environment experience. Bowling skill and knowledge can’t be realized through the ingestion of a pill. Rather, elite bowling takes time to realize. Purposeful practice and detailed planning are at the core. Now it is up to you. Really begin to watch the bowling ball progress down the lane. Notice the changes over time. Do you see the “Y”? If so, move because it is already too late. Reflect on what you saw with your ball motion before the “Y” appeared. Pay attention to the other players on your lane. How is their ball motion changing? The combination of seeing your motion changes as well as other bowlers’ ball motion changes will help you be more proactive in making good moves and decisions. Previous Previous post: Bowling tips: How to eliminate “chicken wing” habit once and for all? 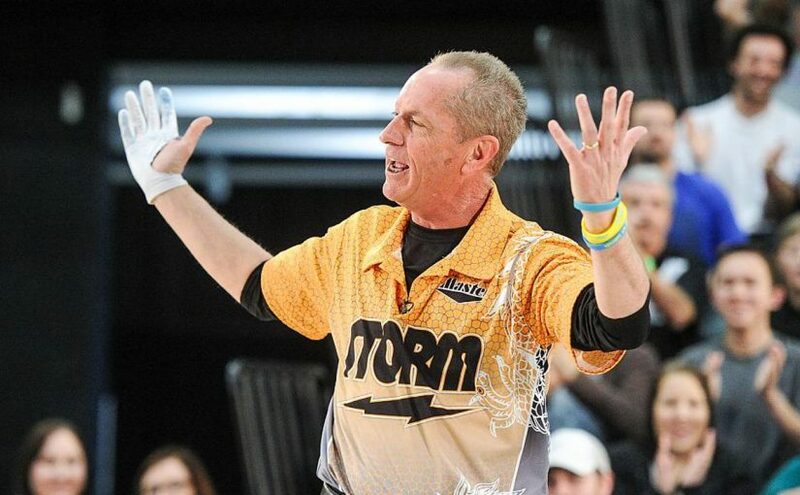 Next Next post: Bowling tips: How to stop grabbing & lofting the ball all over the lane?